ABCD isa square. E,F,G,H are the midpoints of AB,BC,CD,DA respectively. Such that AE=CG=DH. Prove that EFGH is a square? In a right angled triangle, one acute angle is double the other. Then the hypotenuse is 'k'times the smallest side. The k=? The question is attchad. Please send step by step complete solution. 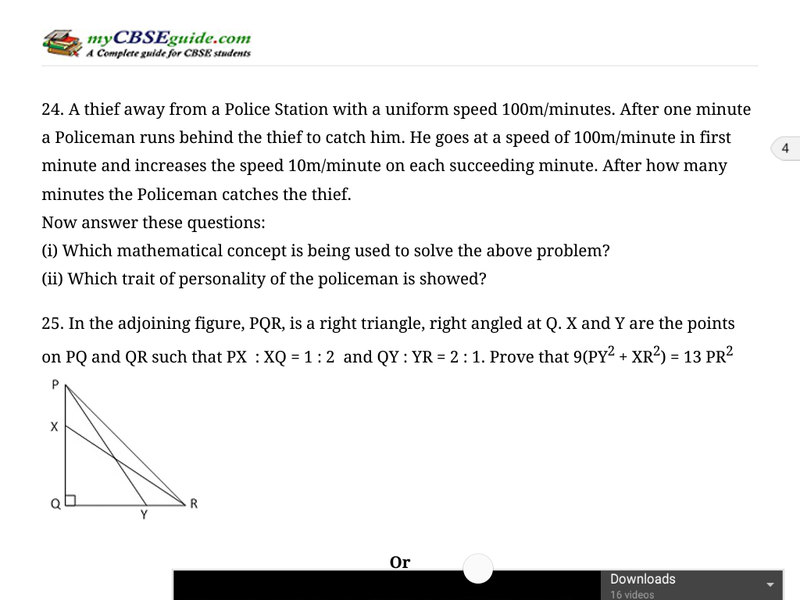 Please do not send any Web link to this question because I am unable to conmnect the same and open the solution every time. Triangle ABC Is an equilateral triangle with it's sides equal to 6a units. AX is a line parallel to line BC. P is a point on AX. From point P a line drawn to intersect AB, AC, BC produced in a point Q,R,S respectively. If PQ=QR=RS then find the length of BR. In triangle ABC, M is the mid-point of AB and a straight line through M and parallel to BC cuts AC at N. Find the lengths of AN and MN, if BC = 7cm and AC = 5 cm. in the diagram given below angle EDC. The tangent drawn to the circle at C makes an angle of 50 degree with AB produced. Find the measure of angle ACB. ABC is an isosceles triangle with AB=AC. D,E and F are midpoints of the sides BC,AB and AC respectively.Prove that the line segment AD is perpendicular to EF and is bisected by it. In triangle ABC, AE is the bisector of angle BAC and AD is perpendicular to BC. Show that angle DAE is equal to 1/2(angle C- angle B). What is the greatest possible perimeter of a right angeled triangle with integer sides lengths if one of the sides has length 12? In triangle ABC, we have AC=BC=7 and AB = 2. 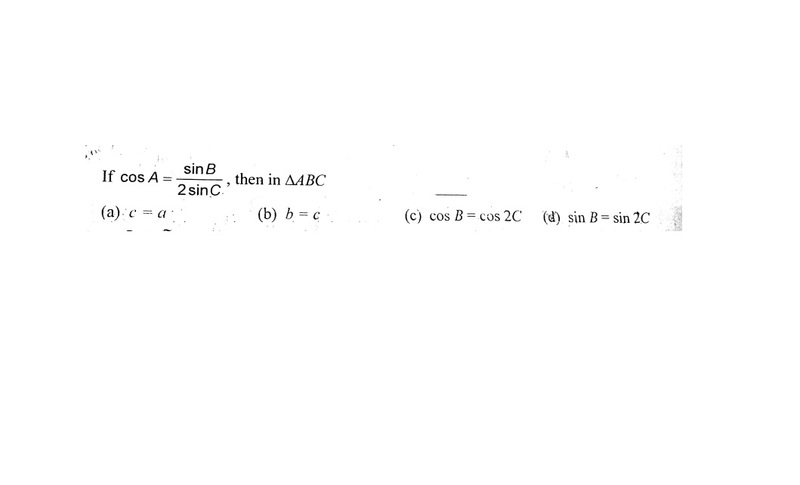 Suppose that D is a point on line AB such that B lies between A and D and CD =8. 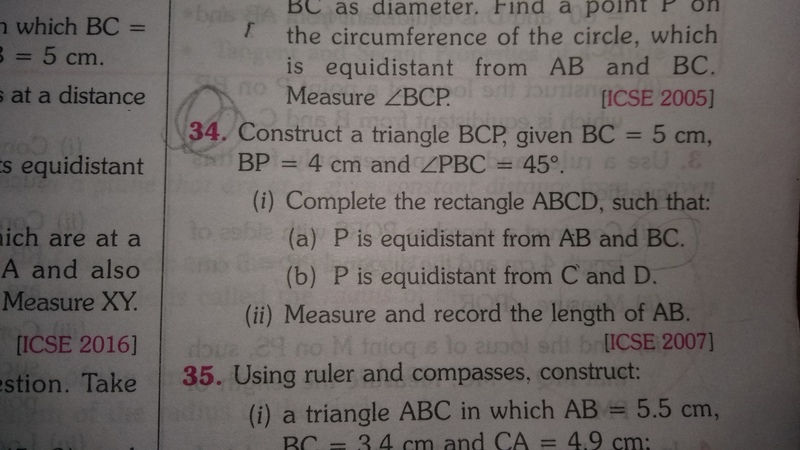 What is the length of the segment BD? In rectangle ABCD , AB=5 and BC = 3. Points F and G are on line segment CD so that DF=1 and GC=2. Lines AF and BG intersect at E. What is the area of triangle ABE ? ABCD is a square and AB =1. Equilateral trianglesAYB and CXD are drawn such that X and Y are inside the square. What is the length of XY? If angle of a triangle are in AP and the length of the two larger sides of the triangle are 10 and 9 units then find the length of the smallest side? What is AAA property ? What is RHS property ? The bisector of angle B & C of an isosceles triangle 🔺 ABC with AB=AC intersect each other at a point O. Show that the exterior angle adjacent to angle ABC is equal to angle BOC. A circle touches the side BC of a ∆ABC at a point P and touches AB and AC when produced, at Q & R respectively. Show that AQ=1/2 (perimeter of ∆ABC). In an equilateral triangle, ABC, D is a point on the side BC such that BD:DC is = 1:3 . Prove that 16 AD^2 = 13 AB^2. Find the area of a quadilateral ABCD in which angle BCA=90° , AB =13 cm and ACD is an equilateral triangle of side 12 cm. Please add a diagram and then solve . Equilateral triangles are drawn on the three sides of a right angled triangle. Show that the area of the triangle on the hypotenuseis equal to the sum of the areas of triangles on the other two sides. A ladder 37m long reaches a window which is 12m above the ground,on one side of the street. Keeping its foot at the same point,the ladder is turned to the other side of the street to reach a window at a height of 35m.Find the width of the street. A TRIANGLE HAVING THE SUM 18. FIND HOW MANY POSSIBLE TRIANGLE CAN BE FORMED. If the area of an isosceles traingle is 60 cm^2 and the length of each of its equal sides is 13 cm , find its base . Prove that the bisector of the vertical angle of an isosceles triangle is perpendicular to the base. If ABCD is rhombus and from D altitude is drawn to Ab and it bisect the AB. Find the angle of rhombus. AD is an altitude of an isosceles triangle ABC in which AB=AC.Show that ( i )AD bisects BC (ii) AD bisects angle A.
Angles of a triangle are in the ratio 1:2:3. Construct this triangle with side between the two smaller angles as 10cm. Measure the other two sides. The two legs of the right angle triangle are equal. The square of the length of the hypotenuse is 200 CM. Find of the length of each leg..
AB=8 cm and M is the mid-point of AB. Semicircles are drawn on AB,AM and Mb as diametrs.A circle with centre C touches all the three circles. Find the radius of circle C.
Construct a right angle triangle ∆ABC using ruler and complas such that angle B=90°,BC = 6cm and hypotenuse CA=8cm. The side (other than hypotenuse) of a right triangle Are in the ratio of 3:4. A rectangle is described in its hypotenuse, the hypotenuse being the longer side of the rectangle. The breadth of the rectangle is 4/5 of its length. Find the shortest side of the right triangle if the perimeter of the rectangle is 180cm. The ratio between base the base angle and the vertical angle of an isosceles triangle is 2:5. Find each angle of the triangle. Perpendiculars are drawn from a point within an equilateral triangle to the three sides. Prove that sum of three perpendiculars is equal to the altitude of the triangle. The perimeter of a triangle is 60cm and its sides are in the ratio 3:4:5. What are in the ratio 3:4:5. What are the length of the sides? In ∆ ABC, the bisectors of ∟B and ∟C intersects at I. A line drawn through I and parqallel to BC intersect AB at P and AC at Q. Prove that PQ = BP + CQ. In triangle ABCis Equilateral and point P and Q trisect BC. Then Prove angle PAQ is 20. In ABC, A = 100 and AB = AC. Find B? Plz solve it sir In triangle PQR, angle QPR = α and angle PQR = β, where α < β. The line RM bisects angle PRQ and RN is the perpendicular from R to the line PQ. What is the size in degrees of angle MRN ? area of an isoscles triangle is 48 cm2. if altitudes corresponding to the base is 8cm ,find perimeter. Prove that the three angle bisectors of the internal angles of a triangle are concurrent. An equilateral triangle is inscribed in a circle , find the radius of the circle. Draw a right-angled triangle. Draw the perpendicular bisectors of its sides. Where does the point of the concurrence lie?